It’s really all about the passion. It’s about passion for watching birds, passion for feeding birds, and then our passion for being able to help you all do that,” said Hilton Head Island’s Wild Birds Unlimited owner Julia Dennis. Taking a rather circuitous route to fulltime shop ownership, Dennis, a former college financial aid director, and husband Sean, a former technical writer and editor, have happily settled into their nest. “When we started thinking about buying the 22-year-old island franchise, we knew people would be coming in because they loved animals, cared about nature, cared about the environment—people who cared about living in harmony with other creatures.” The nature-loving, animal-loving couple knew it was a perfect fit. In the months between joining the franchise “flock” in July 2016 and opening their doors in March 2017, the Dennises spent time at the company headquarters in Carmel, Indiana, trained at and visited other WBU shops, and completely renovated the existing retail space, making it airy and bright, and filling it with all good things to connect customers with their feathered neighbors. Bluffton resident, Bluebird caretaker, and WBU customer Suzy Colson is fan. “Julia and Sean are fantastic, and I was so happy I didn’t have to drive any longer to Savannah almost every other day for meal worms [a Bluebird’s meal of choice].” Her garden is filled with birdfeeders and bird houses, Colson is a regular at WBU, and has even installed nest cams to keep her connected to her backyard birds. Understanding that birds can be particularly particular about what they eat and where they live, the Dennises have created a shop brimming with every imaginable food and feeder, along with their impressive expertise about the local seasons, flora, bird population, and migration patterns. It begins with the care and keeping of the bird food. “We usually get a seed delivery, every 10 days to two weeks” Julia said. “Our food is fresher, and WBU puts together seed blends for what the birds will actually eat, which ultimately saves our customers money.” Customers who join the WBU Daily Savings Club receive discounts on bird food purchases, an extra discount during their Bird Food Sales, and earn Bird Bucks for future purchases. From suet cakes to bark butter, nectar to nesting boxes, gifts, books, feeders, ingenious pole systems, bird baths, fountains, and butterfly houses, Julia and Sean Dennis have feathered a wonderful nest where they are connecting with nature and their customers, with a welcoming passion for it all. 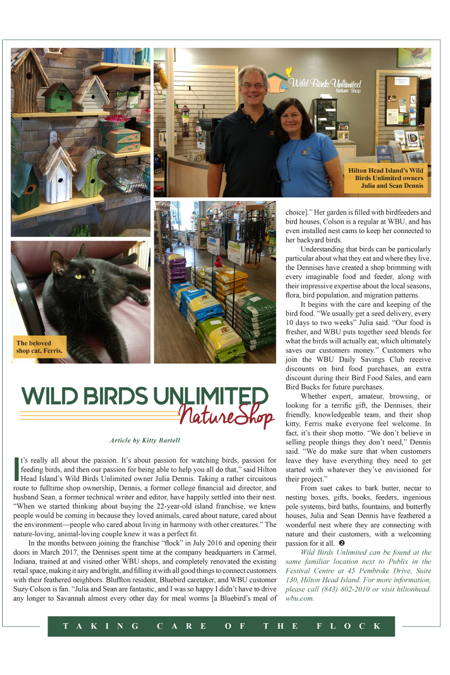 Wild Birds Unlimited can be found at the same familiar location next to Publix in the Festival Centre at 45 Pembroke Drive, Suite 130, Hilton Head Island. For more information, please call (843) 802-2010 or visit hiltonhead.wbu.com.